Happy 80th update! I actually can't believe that I have been keeping this up for so long, just a little more than six months since I started this blog, this is like a new record! Yes, so in Melbourne we had the Melbourne Cup today. Unfortunately, I did not have the same luck as previous years (meaning I actually had to work) but thank god not during the main event, just afterwards. My first time cutting off drinkers tonight (usually they are awesome and don't drink that much) it was slightly scary because they argued as to why they were cut off (they were drunk, duh!). Also it kind of sucked because it meant I couldn't drink today. But hey, at holiday rates I made a lot just by showing up. Unfortunately my luck from the last 3 years eluded me, having to settle for second place in the sweeps, Damn! Anyways, enough about horses, moving on. As previously mentioned I have read Nisekoi recently, which is by Komi Naoshi, the series is ongoing at 4 volumes and scanlations are up to date with Japanese releases. It is a shounen series, a bit different to what I am use to but it was good none the less. 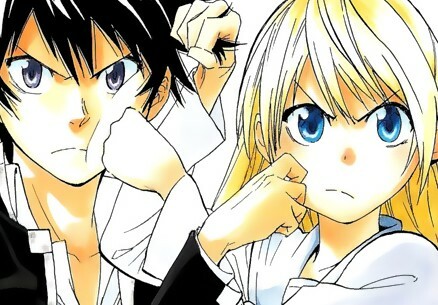 Nisekoi is about Raku and Chitoge, two children of gang bosses who are forced to fake date in order to bring peace and prevent their city being destroyed by gang wars. Of course, the two hate each other, Chitoge claiming she doesn't want to be associated with someone weaker than herself physically, and Raku because he intends to find the girl he made a promise with 10 years ago. However, he can't remember who she is or what she looked like. His only clue being a locked pendant, which can only be unlocked by a key. Raku has a serious crush on Onodera, a friend of his since middle school. Over the series, he builds his friendship with Onodera, continues to fake date Chitoge and has to deal with a fiance chosen by his father. Turns out that Raku knew all three from his childhood but doesn't remember any of it anymore. Over the course of the series, Raku finds out that all three girls also have keys that could match the lock, but none of them have been tried. Whilst fake dating, Raku and Chitoge encounter many problems, such as Claude, who is convinced they aren't really dating and tries to find evidence of this, Seishirou, Chitoge's childhood friend and bodyguard, who is also Claude's minion. It is an ongoing joke that Claude doesn't know that Seishirou is a girl (in fact he even chose a boys name for her, seeing as she was abandoned as a child), Miyamoto, Onodera's best friend who sets up opportunities for Onodera to steal Raku from Chitoge (although Onodera is too honest and has not succeeded yet) and Shu, who sets up opportunities for Raku with all the girls, leading him to be hated by the remaining male population. At this point of the story, it is focusing on how Chitoge has developed romantic feelings for Raku. Although this has been building up for quite some time, it is only in the most recent chapter (49), that she admits this to herself.